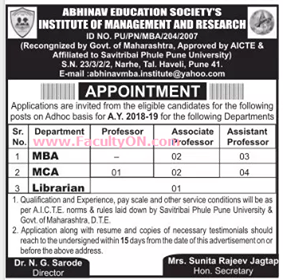 Abhinav Education Society's Institute of Management and Research, Pune has advertised in the Loksatta newspaper for the recruitment of Professor/Associate Professor/Assistant Professor job vacancies. Interested and eligible job aspirants are requested to apply with in 15 days. Check out further more details below. About College: Abhinav Education Society’s Institute of Management And Research has set precedence with its excellent academic track record and unique teaching learning process. It was established in the year 2007 with the MBA Programme and in 2008 with MCA Programme.